Iconic Canadian painter Alex Colville died yesterday. He was 92. 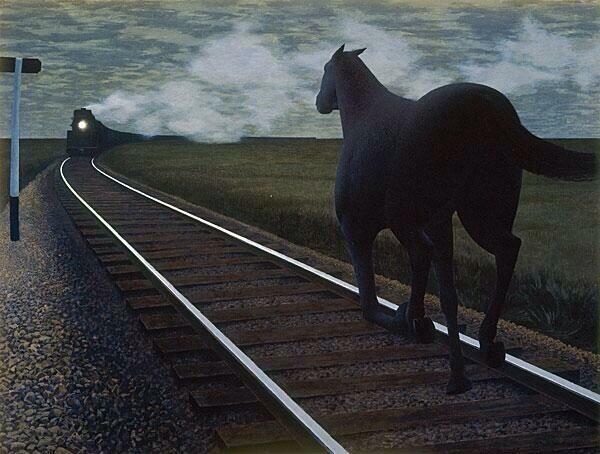 His unmistakeable work includes the 1954 work Horse and Train above (and he was a war painter for Canada in WWII). Beautiful, realistic painting with a aura of dark surrealism, depicting a lot of this country. I went to one of his shows many years ago and met him. I was so impressed that one of the most famous artists in this country would stand around talking with me and my friends for so long. It was clear that we were far too young (and lacking in funds) to be the sorts that came to an opening to purchase art, but he was a kind and genuine person, happy to speak with young people who were enthusiastic about art.